Iranians are known for their bargaining skills. Like many, I wonder if the people of Iran will be able to bargain for change with the hardliners who are in power. 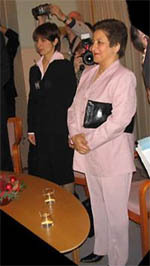 The most well-known voice advocating for peaceful reform inside Iran is that of Nobel Laureate Shirin Ebadi, the first Muslim woman ever to win a Peace prize. Ebadi has consistently stood up against the hard-line clerical government in Iran. She's fought to improve children's and women's rights and she defends political prisoners, but not without a price. She's received death threats and has spent time in solitary confinement. Inside City Hall, Shirin Ebadi is now seated next to the Royal Family of Norway. She wears no headscarf. In Iran this would be illegal but Ebadi says there are no laws in Europe requiring her to cover her hair. Her approach is pragmatic and she draws on Islamic tradition to counter fundamentalist doctrine. In her acceptance speech, Ebadi says, "Islam is a religion where the first divine address to its Prophet begins with the command 'to read'… The Quran swears by the pen and what is written. Such an address and message cannot be in conflict with awareness, knowledge, wisdom, freedom of opinion and expression and cultural pluralism." Ebadi has gone on record stating that some Muslim countries justify repressive governments by saying that democracy isn't compatible with the teachings of Islam. Ebadi says it is. Robin Wright of the Washington Post and author of "The Last Great Revolution" has been covering Iran for the past 25 years. She says Shirin Ebadi is part of a larger movement in the Islamic world. "The 50-plus nations of Islamic world are beginning to go through their Reformation. And that means reinterpreting Islam to allow for multiple interpretations so that there is not just one set of ideas. This is a process that is going to be very difficult, traumatic and even tumultuous in the Muslim world." Ebadi says that the people of Iran have been battling consecutive conflicts between tradition and modernity for over 100 years and that Iranians should be allowed to have a part in choosing their own destiny. "If human rights are not manifested in codified laws and put in place by governments, then human beings may have no other choice that to stage rebellion against tyranny and oppression." But for those Iranians who want to see a complete separation of Mosque and State and an Iran free from Islamic rule, Ebadi is controversial. At a demonstration outside the Nobel Institute, protestors say that the reforms Ebadi preaches will only strengthen the clerics' regime. Later, Ebadi causes an international stir when she uses her Nobel speech to chastise the United States for human rights abuses in Guantanamo. "That platform was created for Iranian women to raise and tackle Iranian problems," says Elahe Sharifpour Hicks, an Iran Researcher at Human Rights Watch. She's disappointed that the Nobel Laureate missed an opportunity to condemn Iran on its human rights record. "She is now a leader inside Iran for human rights movement and nothing else. She shouldn't play into hands of Iranian government. We have many other issues to tackle instead of bashing the U.S. government." On Shirin Ebadi's last day in Oslo, she shook the hand of the Nobel Committee Chair saying, "We need your support." Ebadi is a lawyer. She understands the power of words. She knows the danger of ideas. Throughout history, based on these ideas alone, many have died and many more have been imprisoned. Across the Atlantic, in Washington D.C. at the headquarters of the Voice of America, Reza Pahlavi is getting ready to go on the air and take calls from people inside Iran. He was just a teenager when his father Mohammad Reza Shah fled Tehran on this very day 25 years earlier. 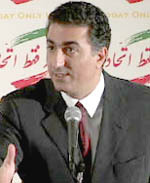 Pahlavi is the leading voice for change from outside Iran. He advocates a return to the constitutional monarchy and says democracy would strengthen not only the country but the region as well. He insists that the United States shouldn't engage in direct dialogue with the current regime in Iran. "Such a regime as it exists has no ability to provide us with such an alternative. This is an irreformable regime. At the end of the day it is a regime that's claim to legitimacy is not on the basis of popular sovereignty, but on divine law to be interpreted by one supreme leader who can decide what is law and what is not." Many of Iran's 70 million people have access to satellite television, Internet chat rooms and radio. The mediums are increasingly being used by the West to reach into Iran. The American Enterprise Institute, a think-tank with strong ties to the Bush Administration, is hosting a town hall meeting that is being fed to Iran from a radio station based in Los Angeles. It's operated by Iranian exiles. Members of the Congress want to fund stations like this one so they can strengthen their signals enough to overcome the Iranian government's efforts to jam the signals. The topic is, "Should the United States help Iran financially, economically or diplomatically in order to help strengthen the forces inside working towards change?" One of AEI's most influential members is Richard Perle, who's also a member of the defense department's advisory board and an advocate of regime change in Iran. "We're not alone in thinking that the regime of the mullahs is dangerous. It's dangerous for us, but it's also disagreeable to the overwhelming majority of Iranians, so we ought to be supporting those Iranians who want to rid themselves of a group of corrupt mullahs who dictate every aspect of their lives." President Bush included Iran in an Axis of Evil along with Iraq and North Korea, but today, the administration is sounding more conciliatory, especially since Iran bowed to international pressure and agreed to nuclear inspections. Richard Armitage, the U.S. Deputy Secretary of State said, "I was very moved by Nobel Peace Prize winner Shirin Ebadi’s comments when she said these movements have to be from Iranians themselves, within the country, and not a function of outside string-pulling." Democratic change is emerging in Iran today. The moderate clerics, lawyers and feminists who have pushed the ruling clerics of Iran to open up are seeing some success. But Robin Wright of the Washington Post says that doesn't mean that deep political change will come soon. "Senior hard-line clerics are unprepared to give up veto power over political change so they allow a wide array of openings, people play chess, popular music, the small things, so that they don't have to give up on bigger issues." Mehrangiz Kar with Karim Lahiji. 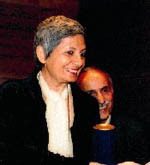 In May, 2002 Kar was awarded the Ludovic Trarieux International Human Rights Prize. Previous recipients include South Africa's Nelson Mandela. Human rights lawyer Mehrangiz Kar came up against the limits of hardliners' tolerance for dissent when she returned from a conference in Berlin. "I gave a lecture against Islamic Republic's Constitution when I came back to Iran. They arrested me and they charged me as someone who worked against National Security Abroad or something like that." Kar spent two months in solitary confinement. After her release, she came to the United States. Her husband, a well-known writer and intellectual, was arrested just after she left and is still in jail two years later. Kar continues, "Everybody inside Iran and outside Iran, they are looking for big changes. I think there is a hidden movement in Iran that is secular but they can't show themselves. They can't have candidates for Parliament. They can't have candidates for presidency. I wish we could have a referendum in the future with the U.N. monitoring so the people could have permission to say yes or no. This is something that I wish and is in my dream." My journey is coming to a close. I can see how the past frames the present. Mehrangiz Kar tells me she wishes the young people of Iran could learn that once upon a time, Iran had one of the most sophisticated legal systems in the Middle East, and that 100 years ago Iran had experimented with democracy and secularism and for a time accommodated modernity and Islam. Now I have learned that my great grandfather Ali Akbar Davar was the architect of that legal system at great sacrifice to himself and his family. On January 11, 1936 at the age of 49, Ali Akbar Davar went silently into his room wrote a long testament and asked his mother for forgiveness. He then swallowed poison and killed himself. For years, it was forbidden by the government of the time to speak his name. Years later, his name showed up on a plaque in front of the Ministry of Justice where it remains to this day. One of the last places my co-producer Rasool Nafisi visited before leaving Iran was the home of my aunt -- Mehraghdas Maleki, the 97-year-old sister of my great grandfather Davar. Rasool says he is so impressed by her memory and her elegance and aristocratic pride. She surrounds herself with pictures of five generations of Davars as she talks passionately about her late brother, Ali Akbar Davar. While in Oslo, I asked Shirin Ebadi if she would autograph a book I had. The book is called Davar va Adlieh (Davar and the Justice System.) 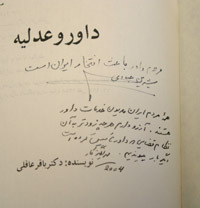 Ebadi signed her name and wrote, "The late Davar is the pride of Iran." He was one of a kind for his country.